My wife and I spent several years going to this condo as our vacation get away, and were finally able to buy it. We feel that the location is the best in the Kona Islander Inn complex, and the view is wonderful. We have spent lots of time living there, and have put lots of effort into decorating it. Please visit our website if you're interested, you can just do a web search for, 'ihu nui vacation rentals' if you would like. You can see many more pictures, and get some other information. We hope to speak to you soon! We just had some sashimi and garlic bread, watched the sunset, and we couldn't be happier! This studio condo was a dream come true for my wife and I when we purchased it in February 2003 from Linda and Grant Baseman. We feel that it is the nicest studio in the Kona Islander complex. Perfect spot for us, lots of extras around the condo available like beach chairs, beach towels, microwave, good sized “mini” fridge, plus plenty of kitchen items which we appreciated. 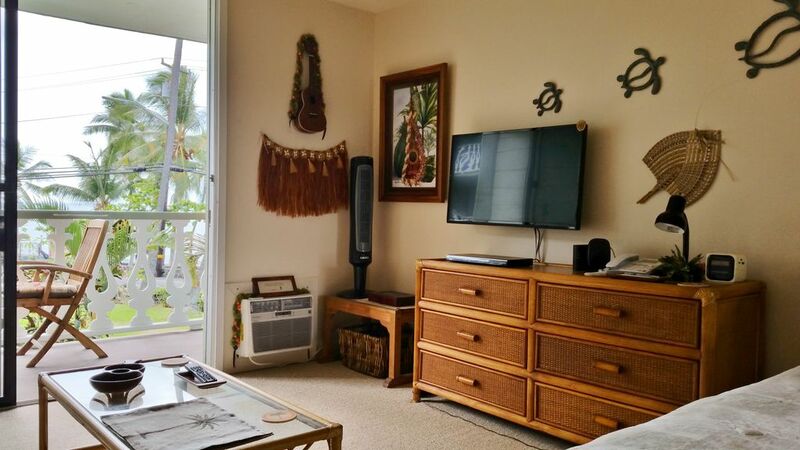 There is no better deal in Kona than this spot with it’s proximity to downtown and ocean view. I’ll never stay in a hotel in Kona again, this was so much more comfy. Cute decor and very clean, thank you for sharing your great spot! I enjoyed my stay very much. The owners put alot of thought into the decor. I had no problems that werent dealt with immediately. The unit affords a ocean view. My only mistake was not alerting the owners of a late flight. I ended up having to check out early. Lesson learned. Love the unit. Susan: Thanks for your thoughts! somebody isn't checking in the same day! James: Thanks for the kind words! Hope you can come back again! Clean and comfortable adobe for vacation rest point. The accommodations were great at the centrally located Kona Islander Inn. Thanks Steven for the Kind words! Hope you can come back again. You are one of Lenora's favorites! Enjoy the rest of your travels. Right across from the ocean! Within walking distance of everything we love about Kona! Snorkeling, the pier, restaurants, Farmer's Market. Shave Ice! Love it. Cindy: Happy Monday to you! Thanks for the kind thoughts! Nice little studio....clean...fully equipped ! Beautiful ocean view....when you could see it....and I didn’t feel comfortable going to the little beach across the street....the homeless issue in Kona really needs to be addressed. Everything about the Kona Islander inn is great...the owner is great at responding quickly to questions....and I loved the place....except right outside the gate!